WASHINGTON — Opponents of marijuana legalization return to one particular number over and over in their arguments: the number of emergency room visits involving marijuana. This Office of National Drug Control Policy (ONDCP) fact sheet breathlessly reports that “mentions of marijuana use in emergency room visits have risen 176 percent since 1994, surpassing those of heroin.” The Drug Enforcement Administration’s “Dangers and Consequences of Marijuana Abuse,” a 41-page tour-de-force of decontextualized factoids, reports that marijuana was involved in nearly half a million E.R. visits in 2011, second only to cocaine. The problem, of course, is that these numbers are meaningless without knowing how many people are using those drugs to start with. When you consider there are approximately 70 times more marijuana users than heroin users in the United States, it makes sense that more of the former are going to the hospital than the latter. Since the government doesn’t provide these comparisons in a meaningful way, I’ve done it myself in the accompanying chart. The raw numbers behind the chart are in a table at the end of this post. The methodology is important here, so I hope you’ll forgive a few paragraphs on where these numbers came from. For 2010, the latest year for which complete alcohol data are available, I grabbed the number of regular users from the National Survey on Drug Use and Health. “Regular,” in this case, means people who report using a given substance in the past month. I then grabbed 2010 E.R. visits involving these substances from the Drug Abuse Warning Network. This is a hospital reporting system that collects detailed data on all E.R. admissions involving a given drug. These E.R. visits can involve the use of multiple substances, so the numbers for each drug involve all visits for which that drug was listed as a contributing factor. Cannabist Q&A: Readers have cannabis questions — health, legal, Colorado-centric, just curious — and we have answers. Since the Drug Abuse Warning Network doesn’t provide information on alcohol-related visits, I obtained the numbers for all E.R. visits involving alcohol from a 2010 National Institutes of Health report. 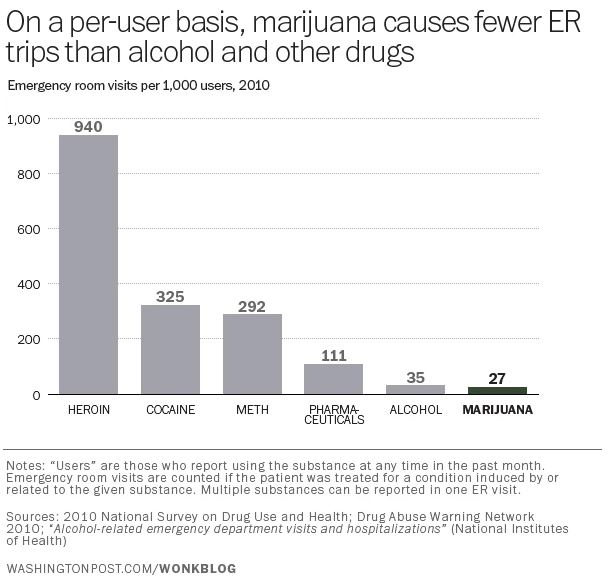 The figures clearly show that on a per-user basis, marijuana is considerably less likely to send you to the E.R. than heroin, cocaine or meth. Marijuana users are also 75 percent less likely to face an E.R. visit than prescription drug abusers. But most surprisingly, marijuana is significantly safer to use than alcohol. For every thousand regular alcohol drinkers there are eight more trips to the E.R. than for every thousand marijuana users. Or in other words, alcohol is about 30 percent more likely to send you to the E.R. than marijuana. These are all the federal government’s own numbers, and they show that marijuana is considerably less harmful to users than alcohol. At the risk of sounding like a broken record, this comports with just about every other credible study of the drug.